Ukraine's Verkhovna Rada adopted on Tuesday draft law No. 6049-d in the second reading and in general to resolve the issue of collective ownership of land, improving land use rules and stimulating irrigation. Some 236 lawmakers voted for the bill, 11 more than the required minimum of 226 votes. 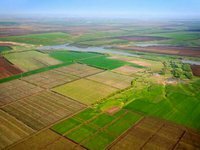 The bill introduces the concept of tracts of agricultural land. Within such tracts agrarians will have the opportunity to exchange plots, conclude sublease agreements without the consent of landlords, rent field roads and optimize areas for cultivation. Agrarians who own/use more than 75% of the tract will have priority rights over other users of the tract. The bill also defines the order of inventory of land plots, which is to take place prior to the creation of arrays. As expected, it will contribute to the updating of the State Land Cadastre. Its results will be approved by local authorities. The document provides for the protection of the rights of farmers who improve and restore hydraulic reclamation systems. In addition, a mechanism of permanent or urgent land easements is being implemented to introduce measures for land reclamation, which can be established both by contract and by a court decision. Users of land plots on which hydrotechnical reclamation is carried out have the right to claim compensation for the costs of hydraulic reclamation of adjacent land plots from their owners or users. According to the document, lands of collective agricultural enterprises whose activities are terminated shall be transferred to municipal ownership of a local community.